Enter the equations of two of the Pet Sitter constraints in the form ac + bd = t, where c represents the number of cats, d represents the number of dogs, and t represents the total space, total cost, or total time. 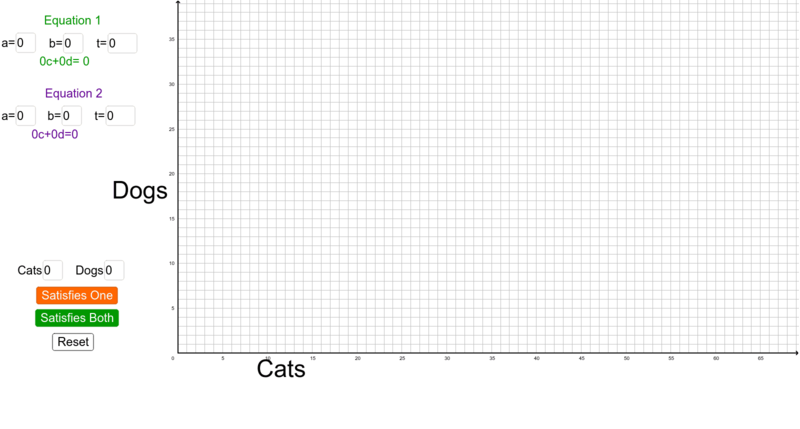 Pick a specific number of cats and dogs and decide if that number of cats and dogs would "satisfy both constraints" or "satisfies one constraint, but not the other." Enter the coordinates of the point in the appropriate boxes and press the button that matches your prediction to plot the point. If your prediction was correct, the points will be plotted in the correct color: green or orange. If not, the point will be plotted in black. Try to avoid getting black points while you are trying to plot at least five points of each of the other colors.